priPrinter is a virtual printer with powerful and interactive print preview. With priPrinter you may print from any application, preview and check pages in many ways and print to a real printer after that. priPrinter may print to any printer, in single or double sided mode. priPrinter supports multiple pages on a single paper sheet. Page layout is very flexible and can be changed on the fly. Booklets,posters, watermarks are supported as well. priPrinter is based on Ribbons. Ribbon increases discoverability of features and functions, enables quicker learning of the priPrinter as a whole, and makes users feel more in control of their experience with the priPrinter. Each feature is easy to find and use. * Print to bitmaps. 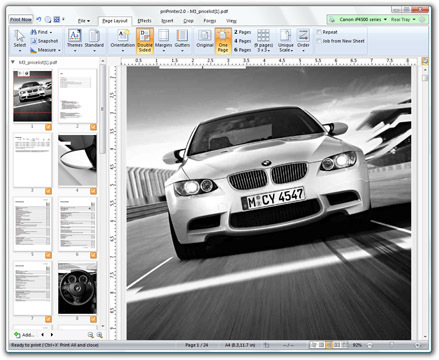 Print pages into image files. JPEG,TIFF, PNG, TGA formats are supported. * Measurements. Horizontal and vertical rulers, measurement tool - you will be sure about exact position of each part of your prints. * Full Screen preview. priPrinter allows you to view all your pages in full-screen mode. * Text selection. Select block of text directly in the print preview area and copy it to clipboard. * Transparent mode - easy to understand which parts are filled by printing applications and which are not. * Text search - search text in document. Qweas is providing links to priPrinter 5.0.1.1435 as a courtesy, and makes no representations regarding priPrinter or any other applications or any information related thereto. Any questions, complaints or claims regarding this application priPrinter 5.0.1.1435 must be directed to the appropriate software vendor. You may click the publisher link of priPrinter on the top of this page to get more details about the vendor.